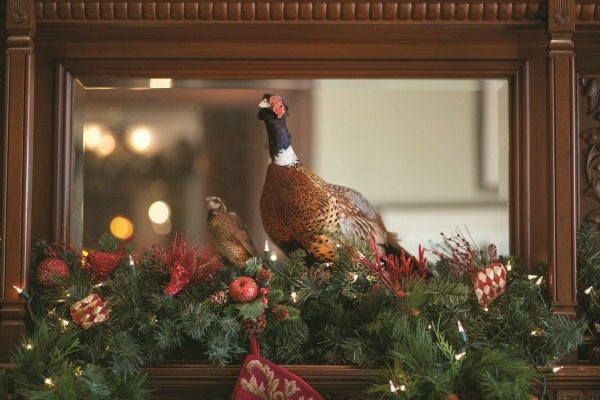 A gamecock, found at a “backwoods” auction, sits proudly among the greenery on the fireplace mantle in the game room. 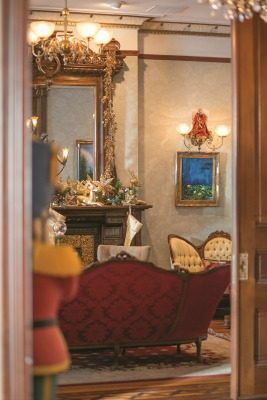 The music room with its grand piano, shimmers with gold holiday décor and candlelight. 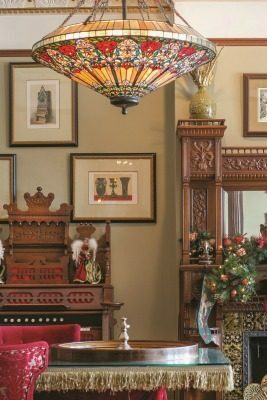 The light fixture on the mantle was originally thought to be just a figurine when Andrew spotted it at a Chicago auction. Furniture in the music room includes pieces that represent the period when the house was completed in 1885, including Eastlake styles featuring rich, red velvet upholstery. Paintings in the impressionist style by local artist Weston Courier flank the large entryway to the dining room. 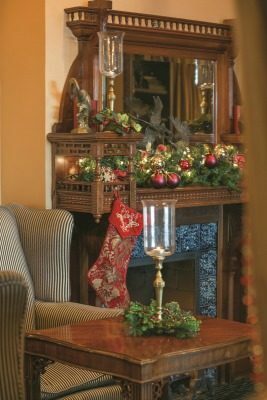 Holiday decorations throughout the house, including those on the front porch provide a festive atmosphere. Across the wide hallway from the music room is the library with its own elaborate fireplace accented with J.J. & G. Low Art Tiles. 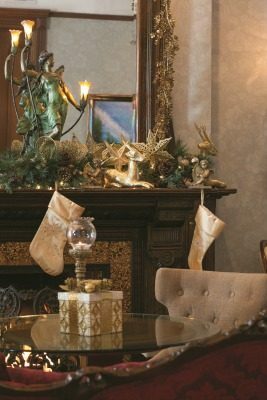 Holiday décor beautifully highlights the detailed craftsmanship of the library’s fireplace mantel. The dining room glows under the soft light of the room’s crystal chandelier and wall sconces. 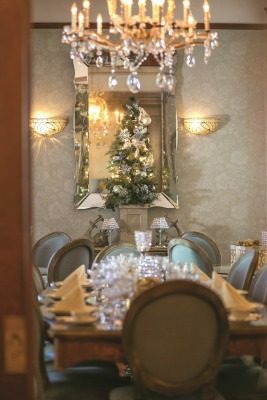 The Venetian glass mirror as well as glass tabletops set with china and silver featuring different patterns makes for a sophisticated dining experience. The music room’s fireplace mantel extends to the ceiling and includes a lion carved into the arched woodwork across the top. The game room is a fun place for guests to congregate. 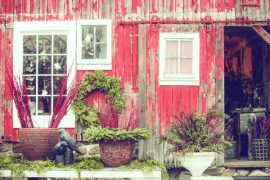 Just some of its highlights include a roulette wheel and the home’s original pump organ, as well as framed architectural drawings. 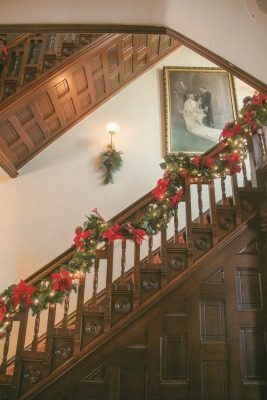 The home’s main staircase to the second floor is made of four different woods, including cherry, and is wrapped with garland, ribbon and tiny lights during the holidays. A large, 4 ft. wide by 6 ft. high pastel watercolor painting purchased at an estate sale also hangs in the stairwell and serves as a perfect backdrop for wedding photos. 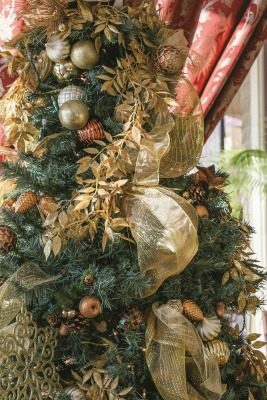 Baker House, the architectural gem with its ornate details fully preserved and recognized by the National Register of Historic Places, is even more stunning during the holidays. 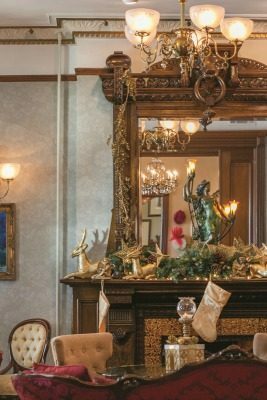 When this luxury hotel is dressed in its yuletide finery and its fireplaces are burning brightly, this giant of a building with its grand scale and elegant appointments welcomes you like a long-lost friend. One could speculate that the property’s refined style mixed with its comfortable ease would be fondly embraced by Emily Baker, who built this Queen Anne beauty over 130 years ago as a tribute to her late husband, Robert Hall Baker. 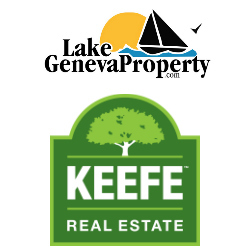 Originally known as Redwood Cottage for its seven patterns of exterior shingles made from the giant California redwoods, the 30 room, 17,000-square-foot home was the work of only the finest craftsmen, and it equaled the design and attention to detail of any home on Geneva Lake. Its 13 fireplaces built with hand-carved mantels are accented with highly collectible, J. J. & G. Low Art Tile manufactured in Chelsea, Massachusetts. 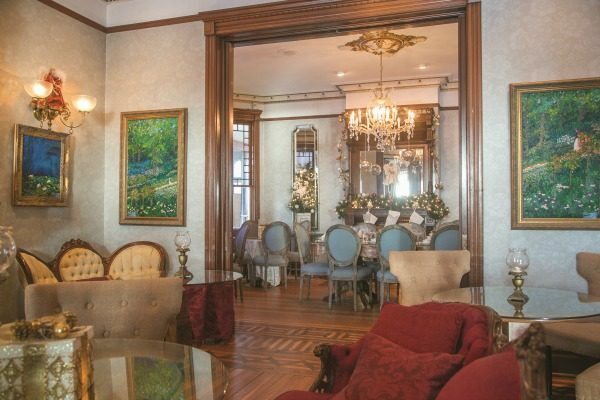 In addition, the home boasts beautiful inlaid wood floors, intricate wood moldings and trim, stained glass windows and ceiling heights ranging from 10-14 feet, giving the salons, parlors and guestrooms massive volume. 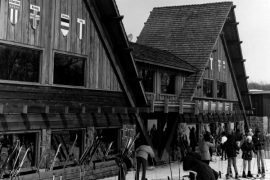 Although the property has been reinvented several times since the Baker family’s use as a summer cottage — a sanitarium for the wealthy, a boarding school for girls, a hotel in the 40s and 50s, upscale restaurants, first the St. Moritz, then Gilbert’s — it wasn’t until 2010 when Andrew Fritz purchased the house that it was truly brought back to its former glory. 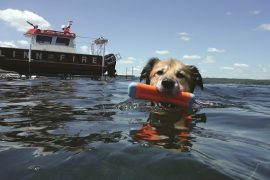 Then he and his expert team painstakingly scoured antique auctions, estate sales and consignment shops to fill this grand dame with period furnishings and unique finds. 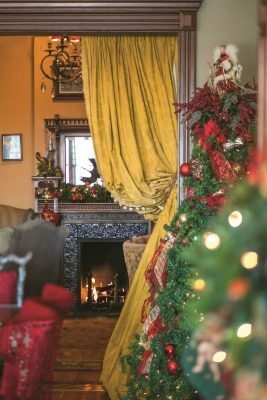 The bygone era of vintage glamour combined with fun and frivolity thrives at Baker House today through regular live music, high teas, murder mystery events and their fabulous Sunday brunch. The property’s slogan, “Come See How Something So Old Can Be, OH! So New,” has never been truer.